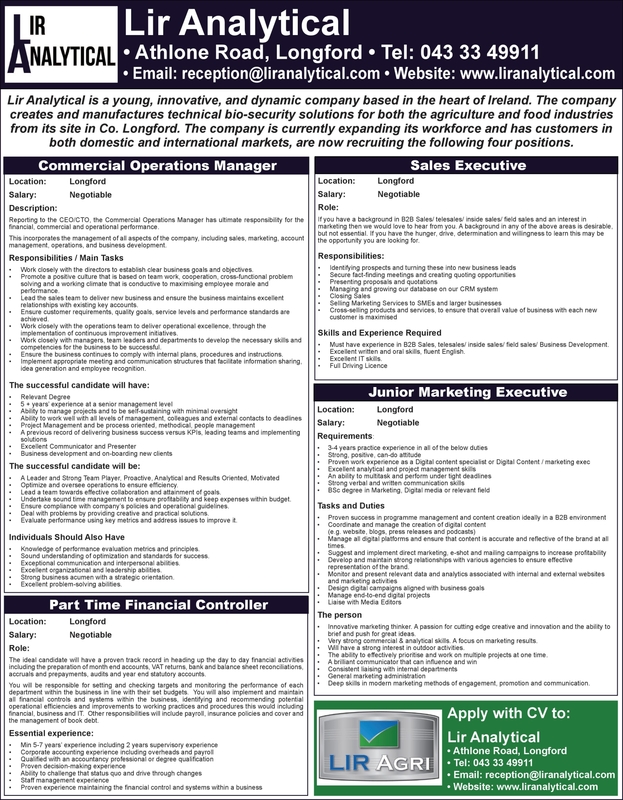 Lir Analytical is a young, innovative, and dynamic company based in the heart of Ireland and they are seeking to fill four new roles. The company creates and manufactures technical bio-security solutions for both the agriculture and food industries from its site in Co Longford. The company is currently expanding its workforce and has customers in both domestic and international markets. Reporting to the CEO/CTO, the Commercial Operations Manager has ultimate responsibility for the financial, commercial and operational performance. This incorporates the management of all aspects of the company, including sales, marketing, account management, operations, and business development. * Work closely with the directors to establish clear business goals and objectives. * Promote a positive culture that is based on team work, cooperation, cross-functional problem solving and a working climate that is conductive to maximising employee morale and performance. * Lead the sales team to deliver new business and ensure the business maintains excellent relationships with existing key accounts. * Ensure customer requirements, quality goals, service levels and performance standards are achieved. * Work closely with the operations team to deliver operational excellence, through the implementation of continuous improvement initiatives. * Work closely with managers, team leaders and departments to develop the necessary skills and competencies for the business to be successful. * Ensure the business continues to comply with internal plans, procedures and instructions. * Implement appropriate meeting and communication structures that facilitate information sharing, idea generation and employee recognition. * Optimize and oversee operations to ensure efficiency. * Lead a team towards effective collaboration and attainment of goals. * Undertake sound time management to ensure profitability and keep expenses within budget. * Ensure compliance with company's policies and operational guidelines. * Deal with problems by providing creative and practical solutions. * Evaluate performance using key metrics and address issues to improve it. * Knowledge of performance evaluation metrics and principles. * Sound understanding of optimization and standards for success. * Exceptional communication and interpersonal abilities. * Excellent organizational and leadership abilities. * Strong business acumen with a strategic orientation. The ideal candidate will have a proven track record in heading up the day to day financial activities including the preparation of month end accounts, VAT returns, bank and balance sheet reconciliations, accruals and prepayments, audits and year end statutory accounts. You will be responsible for setting and checking targets and monitoring the performance of each department within the business in line with their set budgets. You will also implement and maintain all financial controls and systems within the business, identifying and recommending potential operational efficiencies and improvements to working practices and procedures this would including financial, business and IT. Other responsibilities will include payroll, insurance policies and cover and the management of book debt. * Manage all digital platforms and ensure that content is accurate and reflective of the brand at all times. * Develop and maintain strong relationships with various agencies to ensure effective representation of the brand. * Innovative marketing thinker. A passion for cutting edge creative and innovation and the ability to brief and push for great ideas. * Very strong commercial & analytical skills. A focus on marketing results. * Will have a strong interest in outdoor activities. * The ability to effectively prioritise and work on multiple projects at one time. * Deep skills in modern marketing methods of engagement, promotion and communication. If you have a background in B2B Sales/ telesales/ inside sales/ field sales and an interest in marketing then we would love to hear from you. A background in any of the above areas is desirable, but not essential. If you have the hunger, drive, determination and willingness to learn this may be the opportunity you are looking for. * Must have experience in B2B Sales, telesales/ inside sales/ field sales/ Business Development. * Excellent written and oral skills, fluent English. Apply with CV to Lir Analytical, Athlone Road, Longford.